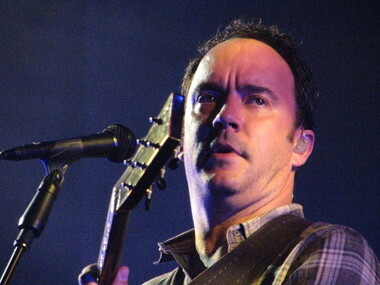 Eventually, this will be a review of the Dave Matthews Band’s spectacular show at Blossom on Saturday night. But for now, it’s a eulogy. Friends, we are gathered here to pay our respects to a much loved individual. Now you may have known him longer, but he and I just met Saturday afternoon. Feeling smug, knowing that there was a DMB concert awaiting me and realizing that picking up song titles in a three-hour marathon of a show is an exercise in frustration, I Googled the band for a recent set list. What we are laying to rest here, brothers and sisters, is the remains of that dear departed – and absolutely USELESS -- set list. The only reliable Dave Matthews Band set list is a dart board with the group’s entire 22-year-old discography. And that, my friends, is a good thing – for the fans and the band. Each night is a new night, a new beginning for us all. Ashes to ashes, etc. Matthews is a prolific and gifted songwriter who produces percussive melodies driven both by his own syncopated acoustic guitar and drummer Carter Beauford’s intricate grooves, and the rest of the band is easily capable of keeping up. Tinsley’s violin; Stefan Lessard’s bass; Jeff Coffin’s sax, pipe and flute; Rashawn Ross’ Caribbean-influenced trumpet; and electric guitarist Tim Reynolds’ fleet-fingered runs add layers of complexity that perfectly complement the esoteric beauty and intelligence of Matthews’ metaphor-laden lyrics and his unique, jazz-infused vocal style. For three entire hours, the band wowed the 17,000 faithful who attended the service. You can’t really say for sure how many songs, although my own semi-official list has 23. Matthews & Co. often segue from one tune to another and back, kind of like another one of those side trips. Besides, no song – not “Crush,’’ not “Belly Belly Nice,’’ not “Captain,’’ not “Say Goodbye,’’ not “Bartender,’’ not “(Kill the Preacher)’’ – goes straight from driveway to destination. Each tune has the possibility – indeed, the PROBABILITY – of turning into a 10-minute jam. One of the hardest things for musicians new to groups is learning how to listen to their bandmates. A DMB show is a primer on how it’s done. Often during instrumental breaks, Beauford, Lessard and Matthews will establish a roller coaster groove and the rest of the band will take turns in the front car on the ride, like a bluegrass jazz fusion band on mushrooms. Then all seamlessly merge back onto the highway. It’s fascinating to watch and even more fun to hear. Matthews himself introduced the opening band, 1950s rockabilly impresario JD McPherson. And when I say 1950s, I’m not kidding. The band led by the Tulsa, Okla.-born McPherson featured a sax, upright bass, guitar and Vitalis ’do, even down to the spit-curl swooping down drummer Alex Hall’s forehead. Their own “Fire Bug’’ and a cover of Bo Diddley’s “Mona’’ made for a perfect appetizer for the feast to come. And with that, we cast the final shovelful of dirt on our late friend, the set list, with an eye towards another staple of a eulogy: the prospect of resurrection, in the form of another show.